Toyota in collaboration with Denso has developed a silicon carbide (SiC) power semiconductor for use in automotive power control units. Toyota will begin test driving vehicles fitted with the new PCUs on public roads in Japan within a year. Through use of SiC power semiconductors, Toyota aims to improve hybrid vehicle fuel efficiency by 10 percent under the Japanese Ministry of Land, Infrastructure, Transport and Tourism's JC08 test cycle and reduce PCU size by 80 percent compared to current PCUs with silicon-only power semiconductors. SiC power semiconductors have low power loss when switching on and off, allowing for efficient current flow even at higher frequencies. This enables the coil and capacitor, which account for approximately 40 percent of the size of the PCU, to be reduced in size. PCUs play an important role in hybrids and other vehicles with an electrified powertrain: they supply electrical power from the battery to the motor to control vehicle speed, and also send electricity generated during deceleration to the battery for storage. However, PCUs account for approximately 25 percent of the total electrical power loss in HVs, with an estimated 20 percent of the total loss associated with the power semiconductors alone. Therefore, a key way to improve fuel efficiency is to improve power semiconductor efficiency, specifically by reducing resistance experienced by the passing current. Since launching the “Prius” gasoline-electric HV in 1997, Toyota has been working on in-house development of power semiconductors and on improving HV fuel efficiency. As SiC enables higher efficiency than silicon alone, Toyota CRDL and Denso began basic research in the 1980s, with Toyota participating from 2007 to jointly develop SiC semiconductors for practical use. Toyota has installed the jointly developed SiC power semiconductors in PCUs for prototype HVs, and test driving on test courses has confirmed a fuel efficiency increase exceeding 5 percent under the JC08 test cycle. In December last year, Toyota established a clean room for dedicated development of SiC semiconductors at its Hirose Plant, which is a facility for research, development and production of devices such as electronic controllers and semiconductors. 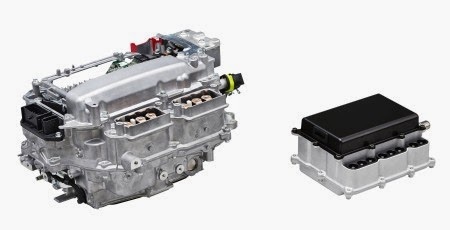 In addition to improved engine and aerodynamic performance, Toyota is positioning high efficiency power semiconductors as a key technology for improving fuel efficiency for HVs and other vehicles with electrified powertrains. Going forward, Toyota will continue to boost development activities aimed at early implementation of SiC power semiconductors. Toyota will exhibit the technology at the 2014 Automotive Engineering Exposition, to be held from May 21 to May 23 at the Pacifico Yokohama convention center in Yokohama.